I love history. I strongly believe that historical fiction is one of the creative ways in which we can teach it without being distant from it or placing it into a box for such so called learning requirements such as Standards of Learning exams. History is more than dates on a timeline. It is a living, breathing remembrance. 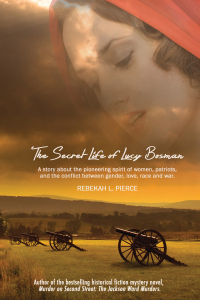 “The Secret Life of Lucy Bosman” is such a remembrance in that the story is told with the intent of demonstrating the choices available or not to women of 19th Century pre-Civil War America – women both black and white. The choices center around the greatest myth ever told in American history, and that is that of the “American Dream.” That dream did not exist for women – women of color, especially – or at least the patriarchal society of that time tried to make it so. But the spirit of woman is resilient and determined, and that is what I wanted to showcase in my novel. That we cannot look at such poignant moments in our history and only place it in one box of discussion. Women have always played a role in the birth and growth of this country as patriots, caretakers, and even more importantly, as entrepreneurs, and we still do regardless of the color of our skin or the class from which we sprouted. This is the power of historical fiction. It tells the story within a flexible frame of context – not just dates on a timeline and exclusively male-centered. As such, I am resharing a review for the novel from a reader outside of the United States. To me, it is proof that this genre has the power to teach and entertain. This entry was posted in education, entrepreneur, Novel, women businessowners, Writing and tagged African American History, African American Literature, author, black historical fiction, blog, Civil War, women's history month. Bookmark the permalink.